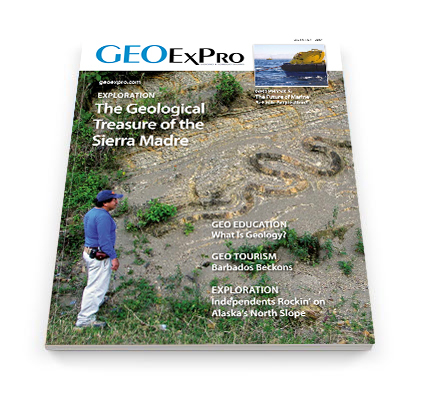 This edition of GEO ExPro magazine focuses on the Arctic, the Caribbean, Mexico and the Gulf of Mexico; and New Technologies for Cost Efficiency. Stephen P.J. Cossey, Cossey and Associates Inc.
A geological detective story that could turn our understanding of the Gulf of Mexixo upside down and reveal the causes of one of the greatest climate changes in geological history. Francisco Bolivar, Richard Cooper and Lucy MacGregor, Rock Solid Images; Jacqueline O’Connor, Jeff Codd and David Kessler, SeismicCity Inc. Combining depth imaging and inversion workflows into a single consistent process has the potential to provide more accurate models in a shorter time than achievable to date. Once again the message is that, despite a phenomenal increase in renewable energy, oil is here to stay. A new marine seismic acquisition method offers full azimuth, full offset coverage, excellent quality data and repeatability, all in a very efficient manner. Discovering a potential new oil and gas province in the north-western sector of the Russian Arctic. UNESCO Geoparks now include 119 areas in 33 countries. We talk to Patrick McKeever about this important initiative.